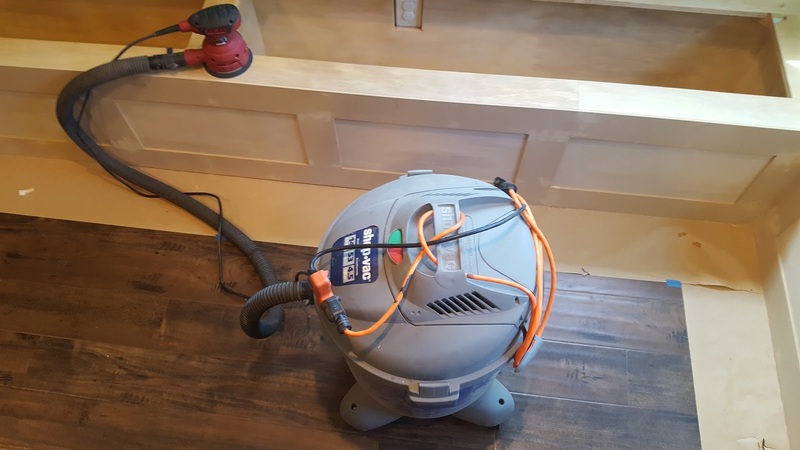 Now that the corner bench is finally going in, I am so pleased with the results that I want to share what is for me a delightful discovery: the orbital sander with vacuum attached. I know, "Big Deal! Orbital sanders have been around a long time. ", but this is working out so much better than my previous experience with orbital sanders, that I think it should be shared. I have been using a 1/3 sheet orbital sander for more than 10 years, but I didn't have great success getting it to work with the vacuum. 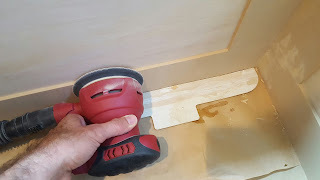 Because of my bench project, I invested in a cheap 5 inch (12.7 cm) round orbital sander with hook and loop sanding pads. It didn't really connect well to my shop vacuum either, but I salvaged a duct from an old vacuum cleaner that serves well as an adapter. After some trial and error, the results have been great! I get almost no dust up in the air when sanding. Far less, for example, than with hand sanding. 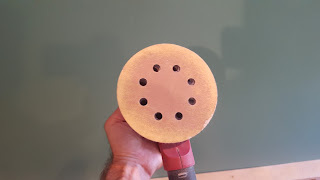 Make sure you line up the holes in the paper with the holes in the sander (approximately). You can use a painting edger to protect adjacent perpendicular surfaces. 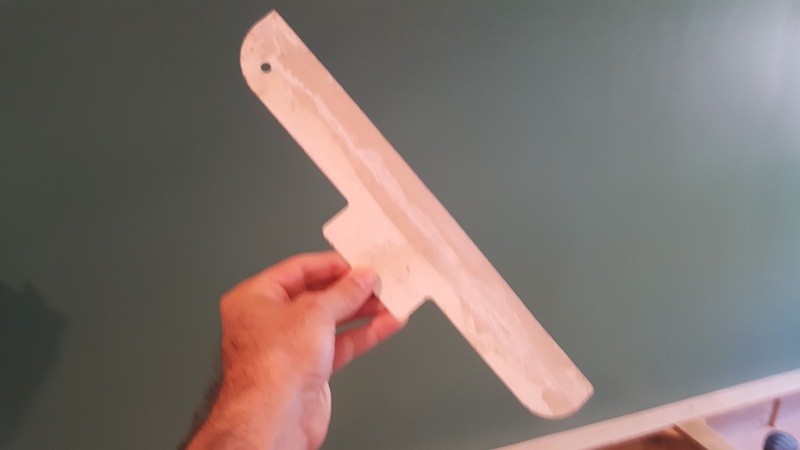 Contrary to the instructions that came with my sander, I only turn it on when it is already in contact with the surface because, in addition to orbital motion, this sander allows rotation. Due to the inevitable imbalance in the pad, the orbital motion is converted to rotation rather quickly when it is free-running in the air. It builds up so momentum so fast that it damages the surface when it first makes contact. This makes it very easy to sand all over the place with the vacuum following along. Notice that the sander cord is wrapped around the vacuum hose then plugged into the extension cord (orange). 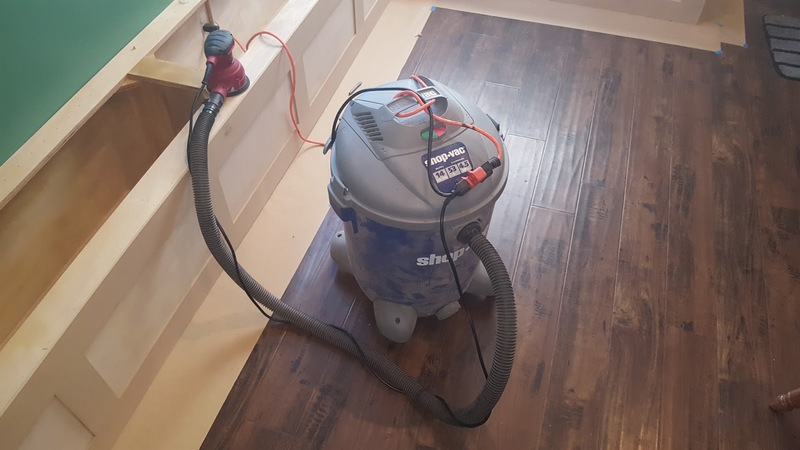 The vacuum cord is only unwound from its storage coil enough to reach the end of the extension cord. The extension cord is loosely tied to the vacuum handle in sort of a lark's head. 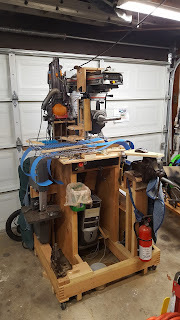 This setup has really proven itself in my bench project, where I have sanded over 100 square feet (9 square meters) with multiple grits. Not only does it almost eliminate dust in the air, but it improves sanding by pulling the dust off the surface so the sandpaper has better contact with the workpiece.